Volume 17 | Tetratab | Dual Bearer Devices: are they suitable for military use? This year in Critical Communications World there is some expectation that manufacturers will be showing dual bearer devices. In particular the devices that are able to provide TETRA and LTE connectivity are the most anticipated - but why are these products needed and how will they be used? Dual bearer devices are anticipated to provide the best type of connectivity through one device, bringing the requirement to just one implementation and one charging, power and accessory strategy. The idea of a dual bearer device is to gain all the benefits that both bearers have to offer. TETRA is a proven, secure and reliable voice communication network and many organisations have a long term use plan for this technology and are satisfied with its security and use case. However, it is widely known that TETRA has limitations regarding data, so a dual bearer device to provide LTE Data services will complete the user experience bringing band width to the user. Limiting the weight a soldier has to carry by having an all in one device. Every gram weight carried reduces the soldiers independence in the field and increases fatigue. Carrying one device - particularly 1 battery - reduces the overall weight. Ensuring that the smart activity of the soldier is done within a secure environment so unknown software or malware is not tracking his private communication. Even in compound there are risks for soldiers and other staff members using or carrying personal devices. These can carry unwittingly tracking and location technologies and malware to mine data. Having a device that gives the soldier data applications they are issued in their normal civilian life but deployed in a secure environment gives the balance of functionality and security. Data capture, in particular photos and videos are more viable with these products. Data can be captured and synchronized or live encrypted using an encryption key over TETRA. Smart applications can be deployed particularly to assist in local language communication and provide the soldier with critical information. The quality of information and data including healthcare in the field could be a lifesaver. Public networks can be used as a backup where TETRA is difficult to deploy. Making use of in field resources, particularly in building where TETRA penetration is poor can keep users in contact where otherwise it would be lost. 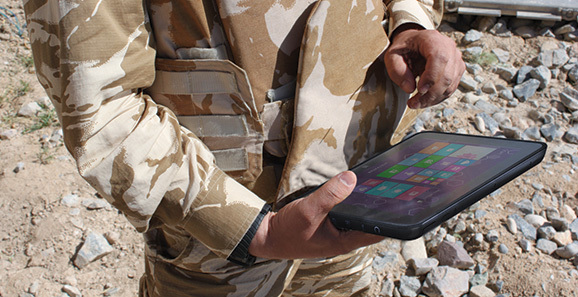 The user interface is more adapted to how soldiers use their personal devices. A user under 25 years old will have only had contact with smart devices and the voice type radios are more difficult and time consuming to train the user. Casepad range of products used today by military on LTE. Photo: © TETRATAB. TETRATAB has been making hand held and computer products that have been dual bearer for over 7 years, the original devices being 3G and TETRA, as well as 4G and TETRA. As a result they have a unique experience in the sector and can advise clients on identifying the correct products for them and the correct implementation. Their outlook is to incorporate the correct radio technology into the correct smart device and ensure that the solution is practical for both the TETRA and LTE use case. The TETRA, in some cases, is not only used for voice but also for carrying low bandwidth encryption information to encrypt the 4G data stream by an independent channel. Some applications already exist and have been implemented where high band width, non secure data has streamed over 4G with then a secure data overlay sent via TETRA. By creating products for military users to mimic those used in the consumer environment makes it easier to train new users and develop better solutions. For example the Casepad range of products, currently LTE only, have already changed the way some think of the mobile data terminal where the smart tablet product has become a dockable smart screen. Dual bearer devices are expected from at least 3 major manufacturers this year at CCW. In this innovative sector, it will be their approach to the current and future use case of the device that will guide their success.